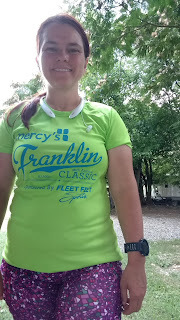 My first week of training for the Iron Horse Half Marathon went well. This was an ease-into-it week with 3 days of running. 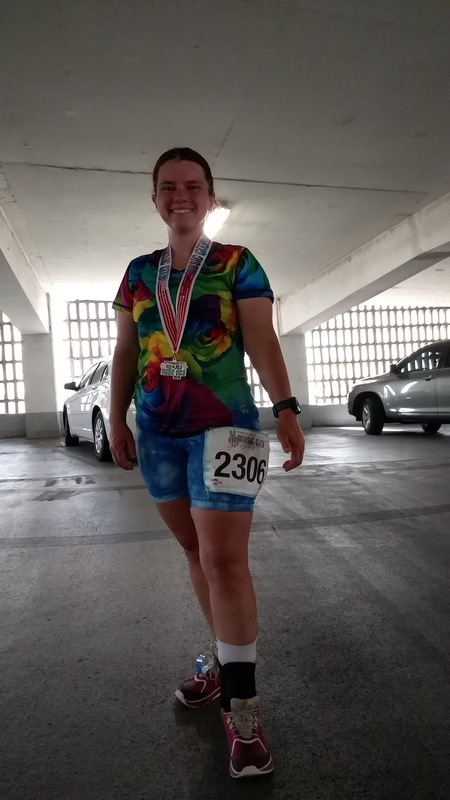 I started off half marathon training with...a 10k. I like to do the Music City 4th of July 10k when I can and this year just happened to coincide with my decision to start training for my next half. It was about 85 degrees and 70% humidity for the 10k and I turned in one of my slowest times at 1:23:10, a 13:25 pace. With the heat and humidity and the fact that I didn't train for this event, I'll take it. I wore my rose INKnBURN tech shirt and got a lot of comments on it. I really like it paired with my lululemon Speed Track shorts with the awesomely deep thigh pockets. I can put my Moto X Pure phone in one pocket and have plenty of room in the other for tissue, keys, and a gel or two. These are my new go-to running shorts. I now have 3 pairs in my rotation. I wore my running brace on my left ankle as I tweaked it playing on a water slide Memorial Day weekend, but it's doing much better now. Just wanted the brace as a precaution. Me after the run about to go home. My second day of running. My target was 3 miles at a 13:54 pace. I ran at River Park in the middle of the day. It was toasty out! Heat and Humidity (yes, capitalized!) added together was 160! I took it easy and jogged for 4.5 minutes and then walked a minute. That worked out well and I came in at a combined pace of 13:53 for the 3 miles. 14:00, 13:48 and 13:51 splits. With running and walking, my splits don't always exactly coincide with an exact target pace. Me after the run. Sporting another pair of my speed track shorts. Every Friday is going to be hill work with no pace target at all. I can walk, crawl or run it, just have to do it. This Friday, I chose a hill near my house. I ran the downhills and walked the uphills. I ended up with 3.3 miles, 15:14 average pace and 630 foot elevation gain. This week, I have 4 days on the schedule. I don't think I ran 4 days in a single week my entire marathon training cycle, so this will be interesting. Great first week! I read your previous post too. I think easing into a little more mileage is wise if you want to increase. The coach I'm working with told me with each training cycle I'll be able to handle a bit more as I gain fitness and experience. Just remember to keep it easy! If you read Hansons, you know that they suggest increasing with easy mileage. I'd just see how you do when you increase and adjust if necessary. Also, love the speed track shorts on you! I tried them but they looked awful on me. I think it's awesome that you're working with a coach! My training paces are loosely based on the Hansons paces as well. I like the idea that I don't have to kill myself during every run and indeed that's counter productive, so I'm looking forward to increasing my mileage with easy miles.